I believe this is a picture of the Invergordon Post Office in the 1800s? It reads ......RDON POST OFFICE, which I believe is INVERGORDON POST OFFICE. It would be great if someone can confirm this. The people are unknown to me. After researching the uniform of Postal Staff Scotland. 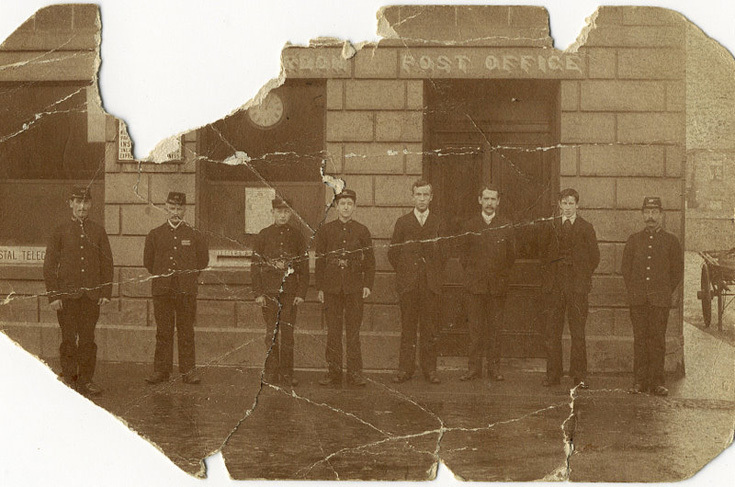 It would seem that the gentleman in the middle of the door would be the Postmaster, the two gentlemen beside him would be his staff/assistants. The two younger boys 3rd and 4th from the left would be Telegram/Messenger boys. I agree that this is the post office at Invergordon and think that it was located in the old Co-OP building on the corner of the High Street and Castle Rd. See picture #12 for architectural likeness. Think you are right Harry. You can also see a vague image of Doctor Auchterlonie's (spelling???) house on the right hand side. Correct Eddie on both accounts I think ..... spelling and the house. I was thinking the same and this morning I actually checked the window placement on the house and it is unchanged. Nothing wrong with your memory then !!! Yes Eddie all correct, Graham beat me to answering you. I always liked the Dr's house and the one next door to it nearer the church. Hi Graham, I was saddened to hear about Sandy also Willie Mackay. Thanks for your thoughts on Sandy and indeed Willie. The pair of them were indeed Invergordon stalwarts and had a lot in common.They were the same age and I am sure you will remember in the fifties and sixties we were next door neighbours, Willie and his parents house in Clyde Street backing onto our house/shop on the corner of the High Street and Bank Street. They went to school together and with the exception of their National Service spent their whole life in Invergordon and passed away within a matter of months of each other. In some ways I find that sad but in others a matter of great sense of belonging and undoubtedly they both in their own way cast their spell on Invergordon. As an Invergordon man, like many others who left the town but still remembers where they came from I am sure you will understand. Well said Graham, indeed they were stalwarts and yes, I understand completely, no need to say no more. So sorry to hear about Sandy and Willie,I remember them both so well. Didn't know they were the same age. Often talked about them with friends,Sandy just a few days ago when I heard he wasn't well.